The state of Washington is the nation's largest commercial producer of oysters, clams and mussels. In addition to their importance to the economy, bivalves can help to clean water and enrich habitat—benefits known as ecosystem services. In 2005, the United Nations Millennium Ecosystem Assessment designated four types of ecosystem services: provisioning (i.e., products an ecosystem provides); regulating (i.e., benefits that come from regulating ecosystem processes); supporting (i.e., services that support all other ecosystem services); and cultural (i.e., non-material benefits that people derive from functional ecosystems). Shellfish account for all four of these types of ecosystem services. Historically, not all harvesting of shellfish has been beneficial. The native Olympia oyster was nearly wiped out in the 19th and early 20th centuries due to overharvesting and pollution, but is making a comeback due to restoration efforts. In 1864, Samuel Clemens, better known to posterity as Mark Twain, spent several happy months in San Francisco. The young writer, as Andrew Beahrs recounts in his book, Twain's Feast, was a dedicated foodie, and he was drawn to one item in particular. Twain would later write that, each night, he felt compelled "to move upon the supper works and destroy oysters gotten up in all kinds of seductive styles." The oysters that Twain so enthusiastically destroyed were Olympia oysters. Although a few were still harvested from San Francisco Bay at the time, the majority of Olys, as the small, sweet bivalves were called, had come from estuaries in Washington state. The name Olympia oyster (Ostrea conchaphila) derives from the prominent 19th century oyster industry along Puget Sound’s Olympic Peninsula, and the region remains one of the nation’s leading exporters of shellfish. The popularity of shellfish of all types has only increased since Twain’s day. In Washington, according to a 2013 report commissioned by the Pacific Shellfish Institute, shellfish aquaculture—which includes oysters, geoducks, smaller species of clams, and mussels—generated $184 million in revenue in 2010, while accounting for nearly 3,000 jobs. But shellfish don't just support the region with money and jobs. They also provides other ecosystem services—benefits that humans derive from the environment. Such services might come from the animals in the system, as when native bees pollinate human food crops; or the vegetation, as when wetlands serve as a means of flood control. Shellfish provide each type of service, says environmental consultant and biologist Marlene Meaders, who spoke at the 2014 Salish Sea Ecosystem Conference in Seattle. Of these, provisioning may be the most obvious. (The ecosystem, as Twain discovered, is delicious.) “I love oysters,” Meaders adds. “I’m a big supporter of the locavore movement.” Culturally as well, shellfish are important heritage markers, and have sustained local tribes and farmers for hundreds and even thousands of years. Shellfish also provide important regulating services. Shellfish reefs can protect shorelines from storm surges or waves. They can help stabilize land. By adding structure to what might otherwise be bare mudflat, they increase an area’s habitat complexity, potentially making it more inviting to juvenile fish in search of refuge from predators, or as a haven for other intertidal invertebrates. Bivalves like clams and oysters are prodigious filter-feeders; some species might filter as much as 55 gallons of seawater in a day. This can lead to another regulating service provided by shellfish: cleaner water. “The presence of shellfish culture can improve water quality by removing anthropogenic sources of nutrients,” says Meaders. 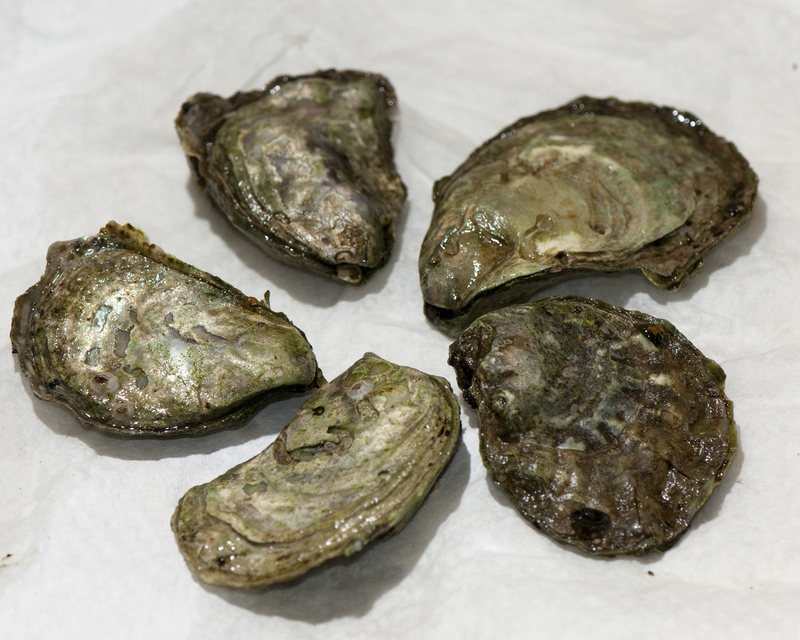 Scientists are starting to explore the role of shellfish as bioremediators. At the conference, Aimee Christy of the Pacific Shellfish Institute described a project in Budd Inlet, in southern Puget Sound. The state of Washington had listed the waterway in 2007 as one of special concern. Pollution from urban development has led to excess nutrients in the inlet, which can promote algae growth, potentially choking the water of much-needed oxygen. In Christy’s study, she and her colleagues attached 300 nylon straps to the undersides of several docks, which then attracted tens of thousands of native mussels. 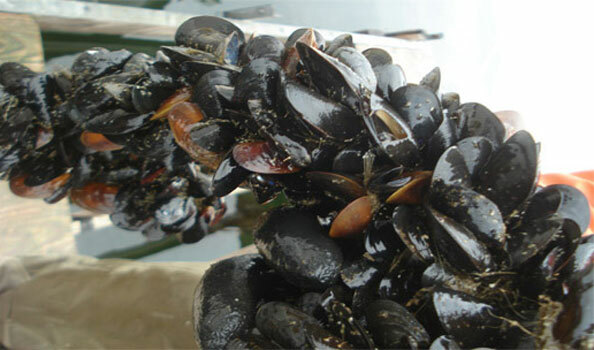 The aim was to estimate just how much nitrogen a growing mass of mussels might remove from a small area. “It’s nutrient bioextraction,” Christy says. By the end of the experiment, she and her team had removed about 4,200 pounds of mussels altogether. Lab tests show that mussels are about 1 percent nitrogen, so the experiment resulted in the removal of 42 pounds of nitrogen from the water. The mussels were then hacked to pieces in a wood chipper and used as compost. The list of potential regulating benefits continues to grow, from bioirrigation, bioturbation, sediment and shoreline stabilization, essential fish habitat, shellfish habitats, significant filtering capacity, eutrophication control, and enhanced benthic-pelagic coupling, among others. That shellfish and shellfish aquaculture operations provide ecosystem services in one form or another is undisputed. More contentious are the potential drawbacks of this human use. Scientists are debating the impacts of aquaculture on native eelgrass, for example. Some point to localized declines from activities like oyster dredging while others argue that declines are minimal across landscape scales. There are also concerns that much of the oyster aquaculture in Puget Sound and the Salish Sea relies on introduced species. Consider Twain’s favored food, the Olympia oyster. The Olympia oyster’s prestige would nearly prove to be its undoing. From the mid-1800s until the early 20th Century, native Olys were overharvested and practically wiped out. To this day, they persist in low numbers at only a few sites in Washington, on state oyster reserves in Willapa Bay and Puget Sound. In the early 20th century, shellfish aquaculture in the region shifted toward Japanese oysters, but Olympia oysters (the only oyster native to the West coast) are now on the road to recovery and can be found at oyster bars throughout Seattle. Endangered oysters are not unique to Puget Sound. A recent study by The Nature Conservancy reports that native oyster reefs have declined by 85% globally, making them one of the world's most threatened marine habitats. That may be further magnified by threats like Ocean Acidification, scientists say. In Puget Sound, only 4% of the region's historic Olympic oyster population currently remains, but you can read about recovery efforts at the Puget Sound Restoration Fund. 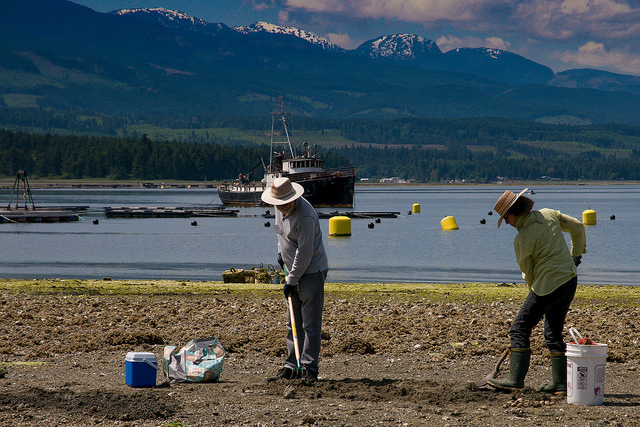 The Salish Sea has a long history of shellfish aquaculture. At the Salish Sea Ecosystem Conference, Amy Groesbeck, a marine ecologist and member of The Clam Garden Research Network, spoke of First Nations' clam gardens in British Columbia that are thousands of years old. During the late Holocene, First Peoples constructed rock-walled terraces to elevate stretches of the intertidal of clam beaches. The walled beaches had slopes significantly less than nearby, non-walled beaches, increasing the area with conditions conducive to clam growth. In response, the density of butter and littleneck clams was more than double that of non-walled beach. “It shows one of the many ways people have been managing and altering marine environments for millennia,” Groesbeck says. Clam gardens are characterized by a level terrace behind a rock wall in the lower intertidal zone. Photo: Amy S. Groesbeck. Learn more about Shellfish beds as an indicator. About 36,000 acres of shellfish beds - approximately 19% – are closed due to pollution sources. Oyster Dredging (UNDERWATER) from Stony Point Pictures on Vimeo. Learn more about Olympia Oyster restoration from the Puget Sound Restoration Fund. Eric Wagner writes about science and the environment from his home in Seattle, where he lives with his wife and daughter. His writing has appeared in Smithsonian, Orion, and High Country News, among other places.